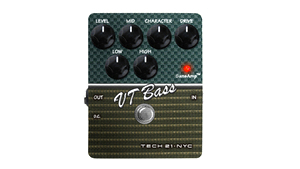 KitMonsters – Tech 21 VT Bass Pedal. The music makers’ guide to making music. Building on the success of the SansAmp pedal, the VT Bass gives a variety of classic bass tones, from chunky funk, to the growl of indie rock, to a fat tube distortion, all in a compact pedal form. With active EQ controls, there is a wider tonal variety available than would be with passive ones. The unique Character knob moves seamlessly between different amplifier model voicing, from vintage clean warmth to powerful lead tones. The pedal accurately replicates the specific traits and speakers associated with each amplifier type, and recreates them when you DI straight into a mixing desk, eliminating the need even for an amplifier at all!